I cant believe it's less than two weeks till Christmas. So I got in to the Christmas spirit and I bring you a Christmas themed design, but with something a little different. I hope you like pink. I used OPI Mod About You as my base. 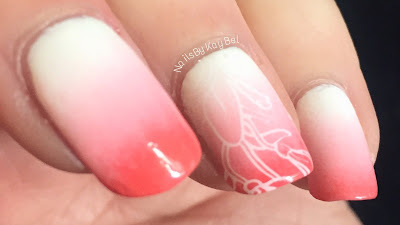 I created a double stamp using OPI Kiss Me On the Tulips and then Konad White. All patterns are from Born Pretty plate BP-01. .
Hi Everyone. 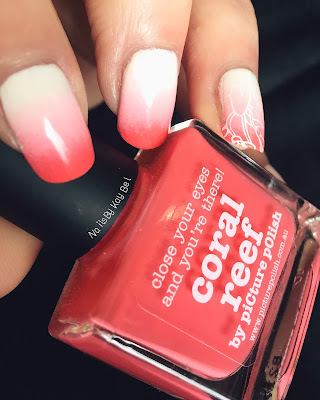 Today I have another gradient with a simple stamp on my ring finger, because I didn't want to take away from the lovely gradient I'd created using piCture pOlish's Coral Reef and Fairy Floss and OPI Alpine Snow. I started the gradient on a base of OPI Alpine snow. The stamping plate used was Pueen112 in Konad White. 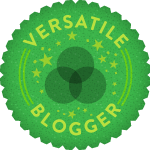 Hope you've enjoyed my blog, and thanks for stopping by. It's a teal-y spotty leopard kinda day. A quick brain squirt I had. Got inspiration from a girls blouse I saw on the train ride home. I hope you like what I came up with. I used piCture pOlish PMT on index and pinkie. China Glaze Pelican Grey on middle and ring. The using Konad plate m57, I filled in the leopard spots with OPI Fly. Two weeks ago, me and my little family went to the Yarra Valley Strawberry Festival in Lilydale. I love strawberries, especially in a smoothie or for breakfast on Yoghurt with Honey and Cinnamon, yum. I came across this event through Facebook and it was actually more popular than what I was expecting. It was so popular they ran out of Strawberries! For this design I used a technique which I've never tried before. I created my own stamp decals. I've seen so many others do this, and I wanted to give it a go myself. I'm glad I made more than what I needed because it didn't quite go to plan as I had hoped. Let's just say it took me a couple goes before I had a result I thought was ok. How do they make it look so easy on YouTube!?!? it might take me a bit more practice, but it was definitely fun trying something new. 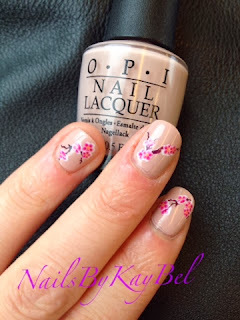 For this manicure I've used OPI Kiss Me On The Tulips. On my ring finger I've got piCture pOlish Fairy Floss (there was plenty of that at the festival!). For the stamp decal itself, it's from Pueen82, using Konad Black and my Squishy Stampers from UberChic. I've filled in the strawberries with OPI Coca-Cola Red and the bows with Kiss Me On The Tulips. Poshé Top Coat to seal it in and make is shine. Hope you had a lovely weekend. See you next time. Today isn't just any other day, it's the one year anniversary me and mr got married! So hope you have an amazing day too. For this I started with a gradient using OPI Alpine Snow and OPI Fly. The stamp used was Pueen-99, with Konad Black. I finished with Poshé fast drying Top Coat. Recently I brought some Born Pretty round plates to bring my collection up to date. And as soon as I saw this image on plate BP-16, I just knew what kind of design I wanted to create. Love it when an image just jumps out at you. I started with a white base OPI Alpine snow. Then created a trio-colour vertical stripe gradient. From the middle outwards started with OPI Alpine Snow, then OPI Where Did Suzi's Man-Go? and OPI On the Same Paige. I used Born Pretty Stamping Plate BP-16 with Konad Black and topped it off with Poshé top coat. I don't think i'm alone here when I say that I love cats, and that includes the big cats too. At home we have two Burmese boys who keep us very busy, who I love to bits. Hope you're all having a great Halloween! My lovely friend Lisa from Jamberry nails gave me these cute little mummy inspired nail wraps to review. And these little critters are just perfect for this Halloween Holiday. And they're super easy to apply! Just when these Jamberry Nails couldn't get cuter, they glow in the dark too!! If you'd like to host a party, Lisa is an amazing consultant and would love to help you and some of your friends have a fun night. 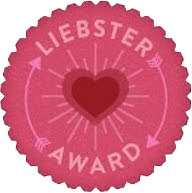 Lisa is based in a northern suburb of Melbourne, Australia. If you're interested or have some question you'd like to ask Lisa, you can contact her via her Jamberry Site at BerryStylish1. Or why not take a browse through her online shop. Hope you're all getting spooked out and enjoying all your naughty treats. I'm totally in love with piCture pOlish's Paris. It's part of their scatter holo range and it's another beauty. It's a soft red, almost a pinkish-beigish-red (if that's possible) and with the gorgeous white/silver flecks and not to mention the subtle holos that just make you fall deeply in love with Paris. 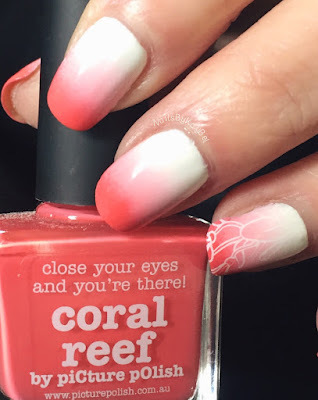 I paired this with a stamp from the large stamping plates from Fun2, this design can be found on plate MJ-VI and Konad Stamping Polish in White. I also recently purchased the Uber Chic XL Soft & Sticky stamper, just wow! I will write up a blog on that to come, but you can find other reviews. I purchased mine after seeing Copycat Claws blog review on the XL Stamper. Call it an impulse buy, but I just had to have it! And let me just say, it's a amazing! On my pinkie, I have OPI - Alpine Snow. As always I've used Poshé top coat. Thanks for stopping by, hope you're having an amazing day! My lovely friend Lisa from berrystylish1 is an independent consultant for Jamberry Nails. She was kind enough to give me a few samples of nail wraps to share with you. Today's first sample I have for you is called Silver Floral (shop here). It's a clear nail wrap with a silver design. The silver floral is like a mirror finish, it's so much more amazing in real life! The great thing about this particular wrap which i really liked is that you can pair it with any colour of your choice underneath. 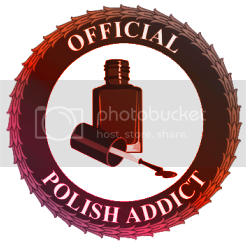 I've paired it with piCture pOlish's Tiffany. Nail wraps from Jamberry are new to Australia so if you're interested in testing them out in person, why not browse through the online shop. You many even want to host your own party!! Just send through your interest by the website. I have a gradient on my ring finger using piCture pOlish Tiffany with OPI This Gown Needs A Crown to match the silver decals of the Jamberry nail wrap. Happy shopping and have a lovely day! 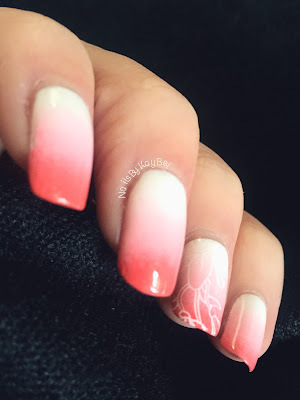 It truly is my favourite technique, the gradient. But unfortunately I had a fatality about two weeks ago (ring finger) and I'm waiting for this little one to grow out a little longer before I chop the rest down to size. But in the meantime I made the most of my longer nails with a graceful gradient then finished it off with some stamp work. The gradient on it's own, it was much more beautiful in real life. Picture Polish Majesty over Beige created more of a holo (very work appropriate manicure before the stamping). I was wondering what to do to celebrate fathers day this year, so it had to be blue... I love deep and royal blues and just recently I've fallen in love with the idea of using matte top coat to create a nail art stamp pattern. I've recreated a classic Fleur de Lis pattern, using Picture Polish G'Day Matte and Born Pretty stamping plate BP-36, over OPI - U Saw We Saw Warsaw. I got the idea from watching Picture Polish's video on their Facebook page. 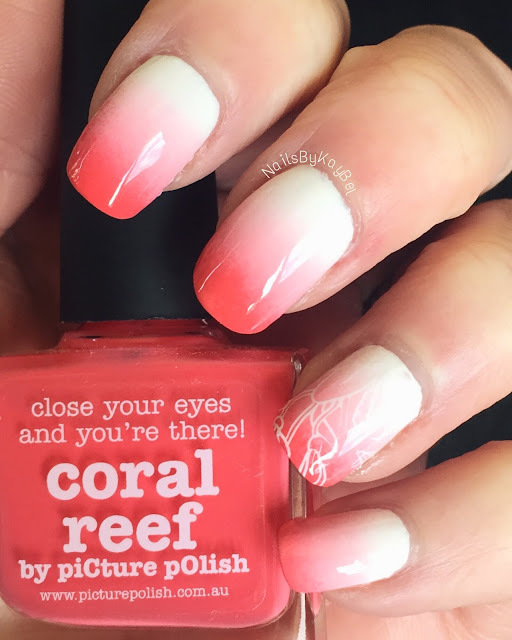 Have you tried stamping with a matte top coat yet? Here in Melbourne it's still blistering cold, but Spring is not far away. So for all those in the southern hemisphere, I'm hoping this manicure brightens up your day. From a previous post (Plum Blossom Water Decals) I had some left overs of these pink blossom water decals.